Very impressed with this dish. Very tasty, easily made… What more could you want? It’s an M&S recipe that I saved to Pinterest ages ago. Typically takes me a while to get round to making recipes I like the look of! Followed recipe to the letter with the addition of extra garlic clove. Would have been nice to serve with garlic bread or just some crusty loaf but I forgot to pick any up. But was filling enough on its own for a light tea. Mine doesn’t look much like the photo in the recipe but I don’t mind that… I’ll be making this again! 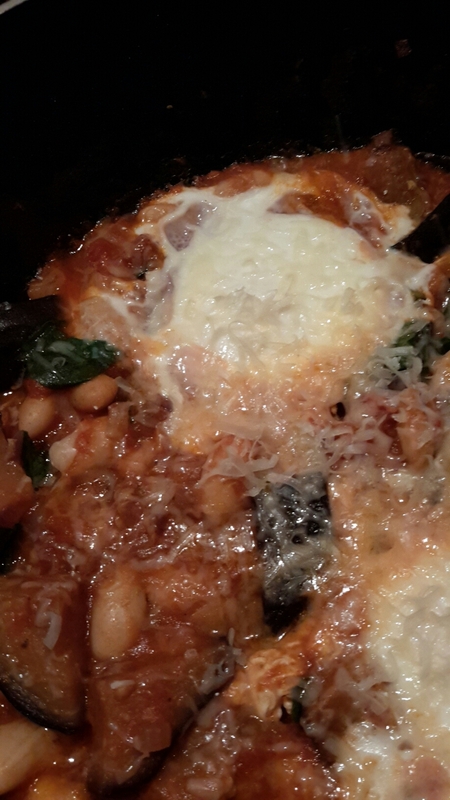 This entry was posted in Main dish, Vegetarian and tagged aubergine, basil, beans, eggs, tomatoes. Bookmark the permalink.